This summer I spent a couple of weeks in Bangladesh. 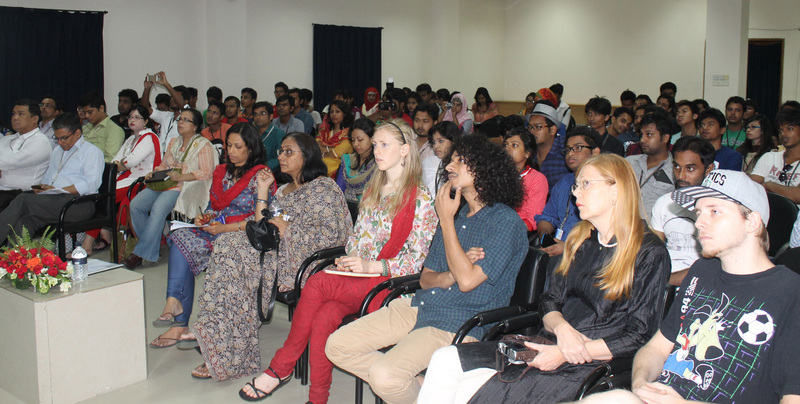 I went there for personal reasons, but I also gave a talk at ULAB (the University of the Liberal Arts of Bangladesh). The talk was based on our book Collaborative Media, and the audience consisted of teachers and students of ULAB, most of them coming from Media Studies. ULAB has the biggest Media and Communications Department in Bangladesh, and as can be seen in the picture below, they are not exactly bad in making their invited speakers feel special. In the talk, of course I tried to relate our writings to the current media situation in Bangladesh. Two topics in particular came into focus. On the one hand, what struck me coming to Bangladesh was realizing how economically prosperous the situation still is for traditional mass media. There are a largy number of daily newspapers doing well or at least reasonably well (most newspapers are published in Bangla, some in English). And commercial television is doing very well. This also means that in relation to the situation in Western countries, job prospects for students graduating from journalism and media programs are good – even to the extent, as faculty at ULAB told me, that it sometimes is difficult for departments to get their students to finish their degrees: they get picked up by companies anyhow.